Since there is an increase in functionality in a smartphone the battery consumption is also high. So now this has become the biggest issue for any smartphone brand since the battery life of smartphones is not at all. There were many alternatives created to solve this issue of low battery life by developing power banks, solar charges, and many other apps to boost battery life. But since those devices were needed to be charged first to charge the smartphone later, so they didn’t turn out to be that successful. So there was a need to find a perfect solution to this problem. Instead of solving the battery life problem of smartphones some great innovators from Kickstarter developed a Talkase. 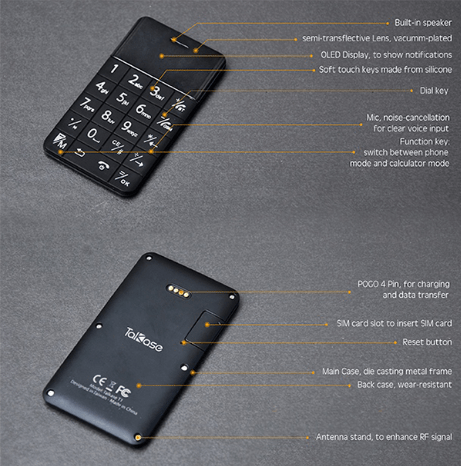 So a talkase is a mini GSM mobile phone which can be connected to any smartphone through Bluetooth and can function as a cell phone. This Talkase developed as a secondary option which can help you in difficult situations such as if you on travel or business trip and your smartphone battery go off then this Talkase can work as your cell phone. Talkase is credit card sized mini GSM phone which supports 2G and 3G. It is available in four colors black, white, blue, and orange. This small credit card size cell phone does look like a calculator but is an excellent support for people who need the other cell phone for work. Since some people still use traditional feature phones for calling purpose since they have an excellent battery life of up to 2 days. So what makes this Talkase useful is that it is a great option for you as a secondary phone which you need just for calling. Since it is so small in the size that it can easily fit in your wallet. Keeping two phones together will not make an ugly bump in your pocket since it is so sleek that it almost needs very less space. It also comes with iPhone 5/5s, 6/6s, 6plus/6splus cover in which you can easily fit this cell phone. Talkase is a perfect backup phone for all of us who use smartphones continuously. Since Talkase comes up with its micro sim slot, you can easily carry two phones together. Since smartphones are getting bigger and heavier if you want to carry something light and small then Talkase is the best option in these scenarios. If you wish to carry these two phones together since it is small and if you are an iPhone user you might feel offended with a small phone in your hand. So this is the best option where the Talkase gets attached to the case of iPhone, so it is easy to handle two cell phones together. Moreover, the Talkase and the iPhone case comes with matching color, so they look great after combined. So putting a light on its features, we come across its dimensions. It is 8.5mm in heights and 48mm wide. It costs 4,490INR which is a bit pricey. It has a P-OLED display of 1.1inch and resolution of 128*30 pixel. For charging it has a different charger in which you need to attach the charger with the POGO 4 pin and supports Bluetooth connectivity with all smartphones. It also supports Bluetooth music and has over 64 types of ringtone since it comes with built-in speakers. It has a battery of 200 mAh rechargeable lithium battery. With a talk time of 2.5~3 hours, it has quite powerful battery backup. Once charged it could stay in standby mode for 4-5 days and if in continuous use it can last two days. It is a good device with great battery backup, Bluetooth support, inbuilt speakers and capability of attaching itself in iPhone case. But the screen is tiny for smartphone users since we are accustomed to working on big screens. It is fully calling purpose device so if used just for calling then it will be your perfect companion. The range of colors is good, and its size is ideal for a backup phone. It can get fully charged in less than 3 hours which is good since you can use it for 2 days continuously. You cannot read any message, so it becomes tough to use as a backup phone since sometimes it is important to access messages. But overall it is a good device if you want for calling backup.